What is my fantasy diabetes device? This prompt is probably supposed to get our creative juices flowing. 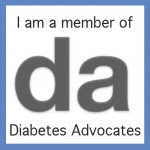 To suggest new and amazing ideas and technology for diabetes. But I can't do that. When I think about a diabetes device that I want, there's only one answer. I want an artificial pancreas. I really, really, really do. I've written about this before, but I'm going to say it again. I don't expect to see a cure in my lifetime. I truly don't. I do think that finding a cure is important, and that one will be found someday. But I don't think I'll live to see it. That's not where I place my hope. My hope is in technology that will make my life better. That will take the strain off of us, and give more of the work to a machine. This hope has grown even stronger since my visit to Medtronic in March. Meeting Lane and the rest of the closed-loop team was an incredible experience. These people are so passionate about what they do. And there are many, many people just as determined at many different companies and organizations working toward an artificial pancreas. It takes my breath away to think about it. The visit made me want a closed-loop system even more than I already did. Some days I want it so badly it hurts. But the visit also gave me hope. Because this will happen. We will have an artificial pancreas. This fantasy will become a reality. I have to believe that. For more Fantasy Diabetes Device posts, click here! Me too, lady. Me too. me three, ladies. me three. I am not a medical professional. Everything on this blog are my personal thoughts and opinions only. Please consult your doctor for any medical advice. Thanks! Want my posts in your inbox? Subscribe by email! Should Patients Engage in the Design of Device Trials? FDA Wants Your Views. Houston . . . We have a PROBLEM! The gun in my basement. Update: The Pump Break Continues. i never announced our babies! "Blu blu blu CHIRP CHIRP CHIRP!" Is That an Insulin Pump? The value of time. . . I showed THAT tree! Yeah! So, there! It's the Blood Sugar Roller Coaster!! !